I have just emerged from a week of being so sick I couldn't even leave the house. I can't remember ever being that sick. It felt like chicken pox with the fever and achyness. Blak. I literally slept all week. I'd wake up and be surrounded by my two cats. I had become a part of their pride. 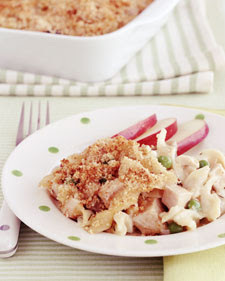 It's from Martha Stewart - and it's a kid's recipe for turkey tetrazzini. I substitute the frozen veggies for fresh veggies. Poor Sarah... I hope you get the spring of Spring back in your step a-sap. Mmmm and I will make your recipe. Looks fantastic!